Define Condition type : In this sub step we will create different type of input tax / out put tax. Condition class Preliminary structuring of condition types e.g. in surchages and discounts or prices. Calculation type for condition Determines how the system calculates prices, discounts, or surcharges in a condition. For example, the system can calculate a price as a fixed amount or as a percentage based on quantity, volume, or weight. Condition category (examples: tax, freight, price, cost) A classification of conditions according to pre-defined categories (for example, all conditions that relate to freight costs). Rounding rule The rule that determines how the system rounds off condition values during pricing. The last digit will be rounded. Structure condition controls whether the condition type should be a duplicated condition or a cumulated condition. This control is only helpful when you use bill of materials or configurable materials. A duplicated condition is duplicated into all assigned items. 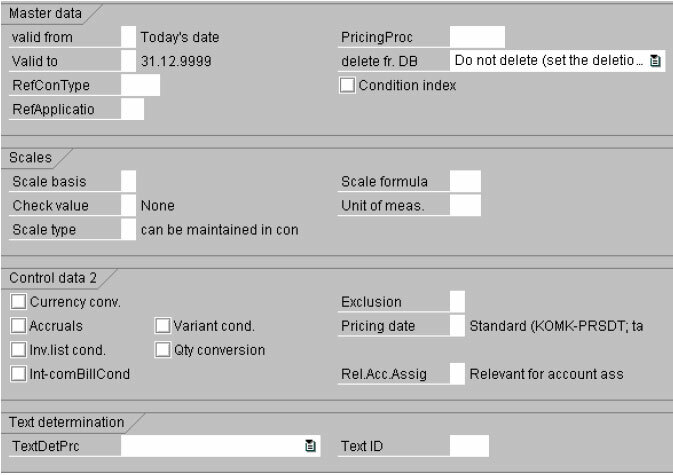 A cumulated condition contains the net value of all assigned items. In this activity, you enter the key for the calculation procedure, which determines the conditions which are allowed per document and which defines the sequence of the conditions in the document for each country. Internal processing key The internal processing keys are used by the system to determine accounts or posting keys for line items which are created automatically. Here you specify whether the tax amount is posted separately or distributed to expense or revenue items. This indicator is set only for Canada. If you select it, the system does not take into account the corresponding tax amount when determining the tax base. In this activity, you determine the structure of the tax jurisdiction code. This code is used for calculating taxes which are defined below the federal level (for example, US taxes, Canadian taxes). The tax jurisdiction code can be subdivided into a maximum of four levels (for example, state/county/city/district). This way the tax rate is defined per level and the tax value is calculated individually per level. If an entry exists for a calculation procedure, then tax processing for this calculation procedure is switched over automatically to the tax jurisdiction code method. In this activity you can also set whether taxes should be calculated at the line item or the "tax code/tax jurisdiction code" level. Refere Country Reference The country reference is a key that creates the reference to a country. Determine taxes line-by-line Taxes are determined on a line-by-line basis. A cumulative amount based on tax code or jurisdiction is not calcualted for internal tax information. 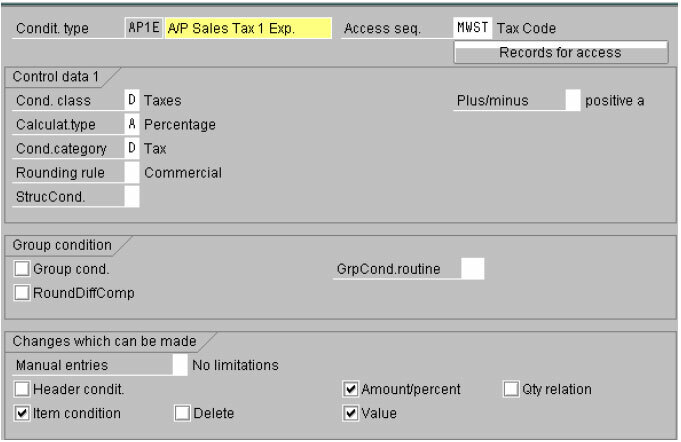 This function is only activated if the taxes are calculated by the system during posting or simulation. Since multiple tax items can be created for each line item, and the maximum number of internal line items is 999, this maximum number of allowed items is, in effect, reduced, when compared to the lines allowed where line-by-line tax calculation is not activated. Line-by-line tax calculation is not supported for postings in external company codes! In this activity, you specify the tax jurisdiction code per tax calculation procedure. The tax jurisdiction code consists of up to four parts depending on the tax jurisdiction code structure for the relevant calculation procedure: the state code, the county code, the city code, and a local code component. The system uses these component parts to determine the tax rate for each tax authority. Discount base amount is the net value Indicator with the effect that the sales tax is not contained in the base amount for discount calculation. The rule that determines how the base amount for discount calculation is to be determined is subject to the relevant country legislation. Either the company code table or the jurisdiction code table is used for control purposes. If tax is calculated using the jurisdiction code, the entries in the company code table are invalid. Control then takes place at the highest level of the definition of the jurisdiction code. This method of tax calculation is used in America, for example. In Germany, the possible discount deduction is first taxed when the document is posted. A tax adjustment is then made when the balance is paid. In this case, the base amount for discount calculation is gross, that is, it includes sales tax. TxN Base amount for tax is net of discount ? Indicator that causes the base amount for the calculation of sales tax to be reduced by the discount share. The rule used to determine the base amount for the calculation of sales tax is subject to the relevant country legislation. Either the company code table or the jurisdiction code table is used for control purposes. In Great Britain, the base amount for sales tax is the invoice amount less the agreed discount. If the tax base amount is net, the net value also has to be chosen as the discount base. Exception: If tax is calculated using the jurisdiction code (USA), the combination 'Net tax base' and 'Gross discount base' is also permitted, however, no tax adjustment is made for payment with a discount deduction. Example : In the following an example is given for each possible combination. In each case, the material value is 100.00, the possible discount percentage 3.00 %, and the tax percentage 10.00 %. You have to define a separate tax on sales/purchases code for each country in which one of your company codes is located. Each code contains one or more tax rates for the different tax types. 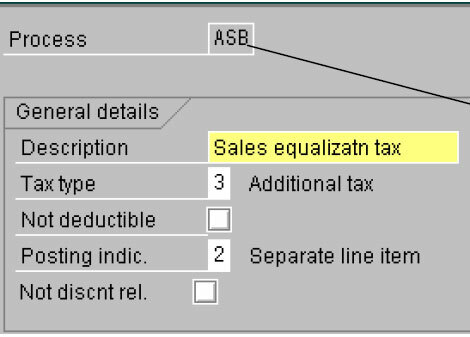 If you have to report tax-exempt or non-taxable sales to the tax authorities, you need to define a tax rate with the value 0 . In this activity , we will define . In this activity, you specify the accounts to which the different tax types are to be posted. The system determines these accounts for automatic postings. In this activity we have to assign GL account no for each and every transaction Key/ Account key that has been assigned at check calculation procedure. 1) Tax on sale or purchase code will be defined at account master control data tab. Here we can defined all tax code for input tax or output tax for tax procedure attached to country and company code or a single tax code. 2) Tax procedure is attached to country not company code, and company code is attached to country. Hence tax procedure indirectly attached to company code.